Describing Umberto Eco as a writer is like describing the platypus as an animal. What do readers expect when they see the author's name on a book jacket? It's a tricky question to answer, given his range and versatility: he has produced studies of semiotics, children's books, medieval history, essays on contemporary culture, and, of course, novels--most notably The Name of the Rose and The Island of the Day Before. So first, a word of warning. 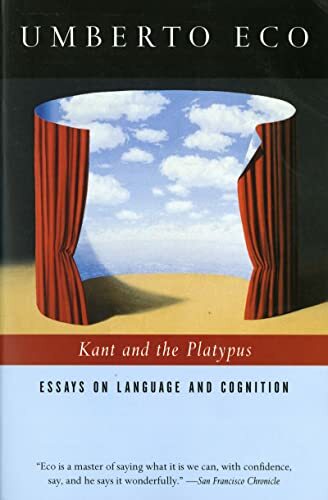 Anyone familiar with Eco the novelist or essayist might well be dismayed by Kant and the Platypus, for this new book returns to his preoccupations of the 1960s and 1970s--to semiotics and cognitive semantics. As such, it can be a daunting volume (the initial chapter, for example, riffs on the numerous philosophical concepts of being). And second, a word of encouragement: this is a wonderful engagement with the issues of language itself. Even as he beckons the reader into one linguistic thicket after another, Eco always keeps a commonsensical perspective, using stories to explicate the knottiest concepts.